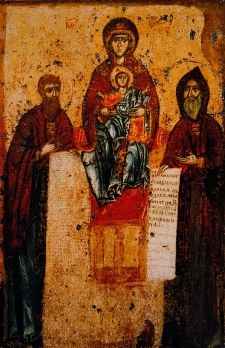 The Sven Caves Icon of the Mother of God was painted by St Alypius of the Caves (August 17). On the icon the Mother of God is depicted sitting upon a throne, and with the Divine Infant on Her knees. St Theodosius is on the right side of the throne, and St Anthony of the Caves on the left. Until the year 1288 it was in the Kiev Caves monastery, where it was glorified by miracles. In 1288 it was transferred to the Briansk-Svensk monastery, which is dedicated to the Dormition of the Most Holy Theotokos. Prince Roman of Chernigov, then at Briansk, became blind. Hearing about the miracles worked by the icon of St Alypius, the prince sent a courier to the monastery requesting that the icon be sent to him at Briansk. They sent a priest with the icon along the River Desna. After the voyage the boat landed on the right bank of the River Svena. After lodging for the night they went to the boat to pray before the icon, but they did not find it there. They saw it on a hill on the opposite bank, resting in the branches of an oak tree. News of this reached Prince Roman, and they led him to the icon on foot. The prince prayed fervently before the icon and vowed to build a monastery on that spot, donating all the land which could be seen from the hill. After the prayer the prince regained his sight. First he saw the footpath, then nearby objects, and finally all the surroundings. After making a shrine for the icon, the prince had a Molieben served, and then they laid the foundations for a wooden church in honor of the Dormition of the Most Holy Theotokos. The tree on which the icon rested was cut up and used as wood for other icons. The Feast day of the Sven Icon of the Mother of God was set for May 3. It is also commemorated on August 17 (the day of the repose of St Alypius the Iconographer). The icon was glorified by healings of the blind and of the possessed, and has long been regarded as a protector from enemies.